I am currently located in the Netherlands and have lived here for 4 years. I have a working visa for the Netherlands and would like to go on vacation to another country in Europe. I however do currently not have my passport as i sent it to an embassy for a visa application. Will I still be able to travel inside of Europe without a passport if I have my residency ID? I have a resident permit, not a true Dutch ID. And I own a passport that is currently in transit. I have called with the KLM and the service employee's conclusion was that I do need to carry my passport with me when i am going to fly, so it seems all I can do is wait and hope my passport is returned to me in the next few days as the amsterdam US consulate (who currently holds my passport) is incredibly difficult to contact for urgent matters. What you have is a common format residence permit. It looks very much like a Dutch national ID card (same format and general appearance, but the colours are different) and is actually a valid ID for many purposes within the Netherlands. 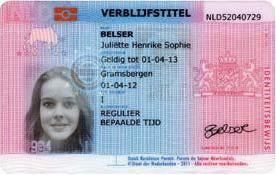 It even says "Identiteitsbewijs" on the card itself, which is arguably a little confusing. What EU law calls a "national ID card" is a different document, which is enough to enter and reside in any EU/EEA country and Switzerland on its own (not only Schengen countries) and even to visit a handful of other countries (e.g. Turkey). In the Netherlands, it is called Identiteitskaart and issued only to Dutch citizens (the rights I just mentioned are attached to Dutch citizenship). By contrast, if you go out of the Schengen area, as a citizen of a non-EU country, you need a passport or another travel document together with your residence permit to cross the border. In practice, your residence permit might be better than nothing when moving within the Schengen area but it's not necessarily a valid ID in other Schengen countries and it's not enough to enter the Schengen area. I suspect most airlines wouldn't let you board a plane with it either (whereas you can often board a flight entirely within the Schengen area only with your passport, i.e. they don't generally check your status). Safest is always to carry both documents, you might get away with only one or the other in some situations but only both together can officially prove both your ID and your status, in all EU countries or when crossing an external border. I have travelled through out "Europe" may times on four wheels and two wheels and have never been stopped in-between countries. The so-called borders are closed and all countries have "free" movement through out the EU. Not the answer you're looking for? Browse other questions tagged schengen passports netherlands chinese-citizens or ask your own question.